In the UK, donations by individuals to charities or community amateur sports clubs (CASCs) are tax free. ​Donating through Gift Aid means that The Laminitis Site can claim an extra 25p for every £1 you give. It won’t cost you any extra. How do I increase my donation through Gift Aid? You simply complete one Gift Aid declaration form for each charity that you support. This is a statement from you to the charity confirming that you want to donate through Gift Aid, and that the charity can reclaim tax back from HMRC on your donation. You can include all donations in the previous 4 years, and indicate that all future donations should be eligible, as long as you have paid enough tax (see below). The Laminitis Site's online Become a Friend of TLS and Donate forms incorporate a Gift Aid declaration - it couldn't be easier to increase your donation by 25%! Once you have completed a Gift Aid declaration, it will cover any future donations you make to that charity. You should tell the charity if you want to cancel the declaration, if you change your name or home address, or if you no long pay sufficient income tax/capital gains tax to cover Gift Aid reclaimed on your donations. ​Are my donations eligible for Gift Aid? Your donations will qualify as long as your total donations to all charities/CASCs are not more than 4 times what you have paid in tax in that tax year (6 April to 5 April), i.e. 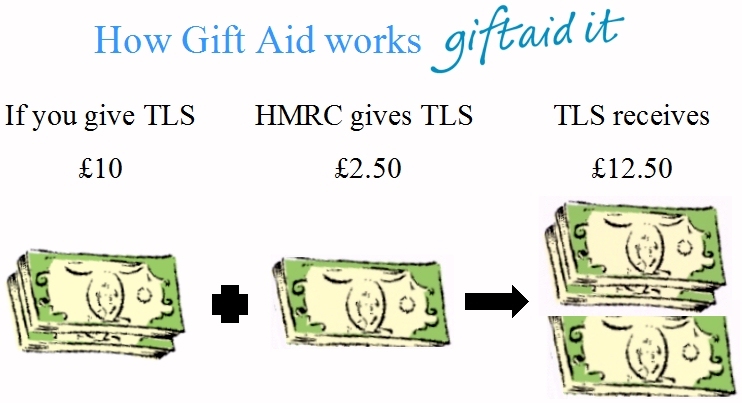 the charity cannot reclaim more Gift Aid than tax you have paid. The tax could have been paid on income or capital gains. VAT and Council Tax do not count. You must tell the charities you support not to reclaim Gift Aid on future donations if you stop paying enough tax.